This is my first post for today. 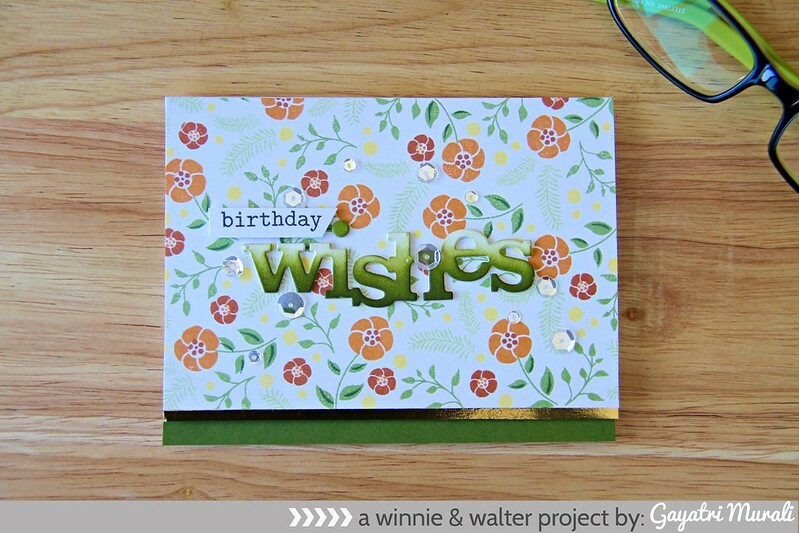 I am sharing a card for Winnie & Walter’s Rerun Feature. Winnie & Walter celebrates rerun every month! Each month a product is featured with plenty of inspirations from designers using that product, a month long sale of that product and a challenge. There is also a new giveaway. You will not want to miss it. This month’s featured stamp set is called In Bloom: Hollie’s Festive Florals stamp set. I love the pretty tiny layering images in this stamp set. They can make such pretty background on the card. That is what I did to make this card. I chose a few images from the stamp set and used Altenew inks to stamp an entire white cardstock panel. LOVE how pretty it turned out. I then trimmed the panel, added a thin strip of gold mirror cardstock and adhered to the card front. I had trimmed off a quarter of an inch of cardstock from the bottom of the card front. I added a matching green cardstock strip to the inside of the card but will be visible from the outside as well. I also die cut In a Word: Wishes cutaway three times. Stacked and glued them down. 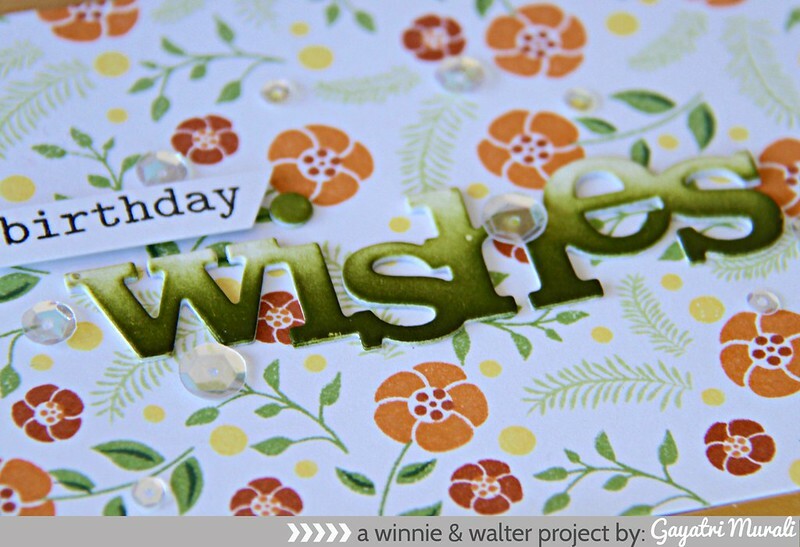 Then sponged Peeled Paint distress ink on the top of the Wishes die cut in ombre fashion. This is adhered in the middle of the card front. The smaller sentiment is stamped on a strip of white cardstock and adhered using foam adhesives. Finally embellished with Sparkly Clear sequins from Pretty Pink Posh. Simple but pretty fall birthday card. By just changing the colours of the flowers, you can personalised the design. There are also different flowers in the stamp set. So pretty, love these colors and the ombré Bold wishes!